Joe Tabet has been advising Entrepreneurs since 1998. After a first experience launching GorillaPark, the leading technology incubator in Europe, he joined the Melcion team in 2002 to focus on advising the individuals and not their companies. In his past experience Joe worked at INSEAD where he launched in1993 The Healthcare Management Initiative (HMI) a research center dedicated to Healthcare Management. In 1996 he became the Programme Manager of CALT (The Centre for Advanced Learning Technologies) a center dedicated to developing and studying new technologies applied to management education, such as multi-media case studies, computer simulations, virtual environments, etc. He wrote a number of articles and case-studies on complex service organizations, quality improvement change management and collaborative decision making. 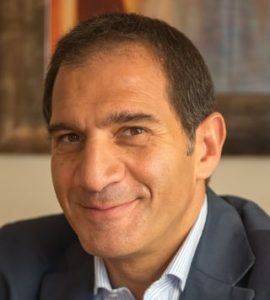 As of 1994 Joe Tabet started lecturing in a number of top executive training programs, in collaboration with top B-schools such as INSEAD (Fontainebleau), Cedep (Fontainebleau), HEC-Entrepreneurs (Jouy en Josas), ESCP-Europe (Paris), Cranfield University (UK), Instituto de Empresa (Madrid), Katholieke Universiteit (Leuven), IAE (Aix-en Provence) and also in-house company specific programs, on the themes of Change Management, Motivation, Persuasion, Engagement, and Complex Decision Making. Joe holds a medical degree specializing in emergency medicine and plastic and reconstructive surgery. He still practices surgery on a part time basis. Since 2007 he splits his time between Paris and New York city where he spends a week a month.